InFocus IN3118HD review | What Hi-Fi? The InFocus IN3118HD is one of few projectors we've tested recently that is made specifically for use in the classroom or office: but don't let that put you off. The Oregon-based projector brand aims to bring a home cinema standard of high-def picture to a more professional setting with its Full HD, 1920 x 1080 DLP projector, priced at £990. We’re usually wary of reviewing business projectors alongside home cinema projectors, as the two tend to have different priorities, the former giving less importance to absolute picture performance. 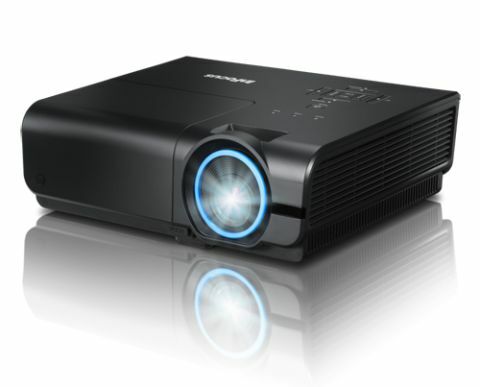 The IN3118HD bucks that trend, and InFocus delivers on its promise: this projector looks great. If this is the new standard of quality for classroom projectors, we’ll pay more attention in class. The picture is bright, clear and there’s minimum noise. There’s no 3D on board but the IN3118HD performs well across both Blu-ray and DVD, with no discernible motion issues. Play Star Trek and you’ll find the interior of the USS Enterprise shines brightly, with whites and the trademark lens flares looking sharp and punchy. Business projectors tend to have high levels of brightness to ensure images can be seen in a lit room, and the IN31118HD follows that trend with an impressively rated 3600 lumens – the brightest in this test. In fact, we’d tone it down just a touch to prevent any unnecessary bursts of glare. Black levels are respectable, but not as deep as we’d like; there’s hints of detail in shadows, but not as subtle or layered as its competitors like the Epson EH-TW5910. The IN3118HD has built-in speakers, but a 5W output is thin and unremarkable compared with the 10W and 20W on offer from its rivals. We had to boost the treble and bass levels to make it sound more substantial and clear. The projector is fairly uncomplicated to set up. A THX Optimiser disc is your friend here: the aspect ratio test is a great way of centering the image on your projector screen or wall. One thing we’d note is that, as with all projectors, it’s well worth taking time to run through the various menu options. Tweaking parameters like gamma can make a big difference. There’s ample connection, both for laptops (VGA connections) and AV equipment (two HDMI inputs), along with an RJ45 ethernet port for update alerts over the network. A small, backlit remote is included – always convenient when watching films in a dark room. We’re pleasantly surprised and impressed with the IN3118HD. Don’t let that ‘office’ label deter you: this is a talented projector that stands confidently alongside its class rivals.